From boosting the immune system to improving gut health, onions are a reliable, versatile and affordable staple that can be easily ‘disguised’ for fussy eaters in your favourite family meals. Immune booster. One onion provides between 15-20% of an adult or child’s recommended daily intake of Vitamin C. This essential nutrient is important for normal growth and development and warding off the winter bugs. Plant power. Onions deliver a unique bundle of plant compounds, like quercetin, which help fight inflammation, as well as sulfur-containing compounds that protect against some cancers and assist in removing the stress on our bodies from environmental factors, such as UVB damage. Good for your gut. Onions contain prebiotic fibres that help with digestion and assist with increased mineral absorption, including calcium, magnesium and iron. Slim picking. A 75g serve of onion provides only 96 kilojoules – a great waistline friendly choice. Heart health. 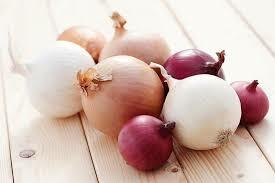 Onions are packed full of flavonoids – a type of antioxidants are proven to reduce the risk of heart disease. Cooking onions does not significantly alter the nutritional value. Whether raw, sautéed, baked or caramelised, go ahead, toss in an onion and reap the benefits. It’s the everyday veggie that helps keep you healthy on the inside and out.